Aneurysm of the aortic sinus, also known as the sinus of Valsalva, is comparatively rare. When present, it is usually in either the right (65-85%) or in the noncoronary (10-30%) sinus, rarely in the left (< 5%) sinus. This type of aneurysm is typically congenital and may be associated with heart defects. It is sometimes associated with Marfan syndrome or Loeys-Dietz syndrome, but may also result from Ehlers-Danlos syndrome, atherosclerosis, syphilis, cystic medial necrosis, chest injury, or infective endocarditis. If unruptured, this type aneurysm may be asymptomatic and therefore go undetected until symptoms appear or medical imaging is performed for other reasons. A ruptured aneurysm typically leads to an aortocardiac shunt and progressively worsening heart failure. An aneurysm of the aortic sinus may rupture due to infective endocarditis involving the aortic wall and tertiary-stage syphilis. The manifestations appear depending on the site where the sinus has ruptured. For example, if the sinus ruptures in a low pressure area like the right atrium or right ventricle then a continuous type of murmur is heard. 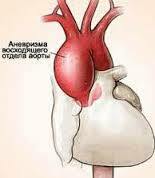 The murmur is located in the left parasternal region mainly confined to the lower sternum. It is also accompanied by a superficial thrill. A ruptured Sinus of Valsalva abscess represents a surgical emergency. Medical therapy of aneurysm of the aortic sinus includes blood pressure control through the use of drugs, such as beta blockers. Another approach is surgical repair. The determination to perform surgery is usually based upon the diameter of the aortic root (with 5 centimeters being a rule of thumb - a normal size is 2-3 centimeters) and the rate of increase in its size (as determined through repeated echocardiography).